All Morale Patches in the ZERO7ONE Store are on sale for $4 each. Gorilla Ammunition is offering a Father’s Day sale of 25% off their ammo until June 19th. Rainier arms has the new MILSPORT Arms Skeletonized 80% Lowers on sale right now for $69.33. Rainier Arms has yet another new product being released. 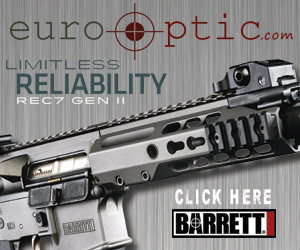 This time it is the SWITCH 5.56 Rail in both 12″ and 14″ lengths. With an attachment method like the Fortis Manufacturing SWITCH Rail, this rail will be a cinch to install, remove, and replace with the same type of rail in either a different length or for varying mission requirements. This version of the quick detach rail system SWITCH is a Rainier Arms exclusive. It features a brand new mechanism that allows a tool-less removal of the rail itself for easy access to the proprietary barrel nut and gas block, and what we believe is most important, is to be able to quickly change rails for a variety of mission or competition specific setups. This 5.56 versions weighs in at a mere 8.5 oz for the 12.42″ and 9.8 oz for the 14.76″. Each model will feature Keymod Slots and QD Attachment Points at the 3, 6 and 9 O’clock position as well as a full length Picatinny Rail on top. The SWITCH, is a revolutionary design that not only looks great and feels phenomenal in hand, but is incredibly functional and adds minimal weight to the rifle – this is truly an exciting new piece of kit. Weight: 8.5 oz or 9.8 oz minus barrel nut. Barrel nut is 1.6oz.